An image made of about 300 million pixels is being released by ESO, based on more than 64 hours of observations with the Wide-Field Camera on the 2.2m telescope at La Silla (Chile). The image covers an 'empty' region of the sky five times the size of the full moon, opening an exceptionally clear view towards the most distant part of our universe. It reveals objects that are 100 million times fainter than what the unaided eye can see. Easter is in many countries a time of great excitement for children who are on the big hunt for chocolate eggs, hidden all about the places. Astronomers, however, do not need to wait this special day to get such an excitement: it is indeed daily that they look for faraway objects concealed in deep images of the sky. And as with chocolate eggs, deep sky objects, such as galaxies, quasars or gravitational lenses, come in the wildest variety of colours and shapes. The image presented here is one of such very deep image of the sky. It is the combination of 714 frames for a total exposure time of 64.5 hours obtained through four different filters (B, V, R, and I)! It consists of four adjacent Wide-Field Camera pointings (each 33x34 arcmin), covering a total area larger than one square degree. Yet, if you were to look at this large portion of the firmament with the unaided eye, you would just see... nothing. The area, named Deep 3, was indeed chosen to be a random but empty, high galactic latitude field, positioned in such a way that it can be observed from the La Silla observatory all over the year. Together with two other regions, Deep 1 and Deep 2, Deep 3 is part of the Deep Public Survey (DPS), based on ideas submitted by the ESO community and covering a total sky area of 3 square degrees. Deep 1 and Deep 2 were selected because they overlapped with regions of other scientific interest. For instance, Deep 1 was chosen to complement the deep ATESP radio survey carried out with the Australia Telescope Compact Array (ATCA) covering the region surveyed by the ESO Slice Project, while Deep 2 included the CDF-S field. Each region is observed in the optical, with the WFI, and in the near-infrared, with SOFI on the 3.5-m New Technology Telescope also at La Silla. Deep 3 is located in the Crater ('The Cup'), a southern constellation with very little interest (the brightest star is of fourth magnitude, i.e. only a factor six brighter than what a keen observer can see with the unaided eye), in between the Virgo, Corvus and Hydra constellations. Such comparatively empty fields provide an unusually clear view towards the distant regions in the Universe and thus open a window towards the earliest cosmic times. The deep imaging data can for example be used to pre-select objects by colour for follow-up spectroscopy with ESO's Very Large Telescope instruments. But being empty is only a relative notion. True, on the whole image, the SIMBAD Astronomical database references less than 50 objects, clearly a tiny number compared to the myriad of anonymous stars and galaxies that can be seen in the deep image obtained by the Survey! Among the objects catalogued is the galaxy visible in the top middle right (see also ESO Press Photo eso0614) and named ESO 570-19. Located 60 million light-years away, this spiral galaxy is the largest in the image. It is located not so far - on the image! - from the brightest star in the field, UW Crateris. This red giant is a variable star that is about 8 times fainter than what the unaided eye can see. 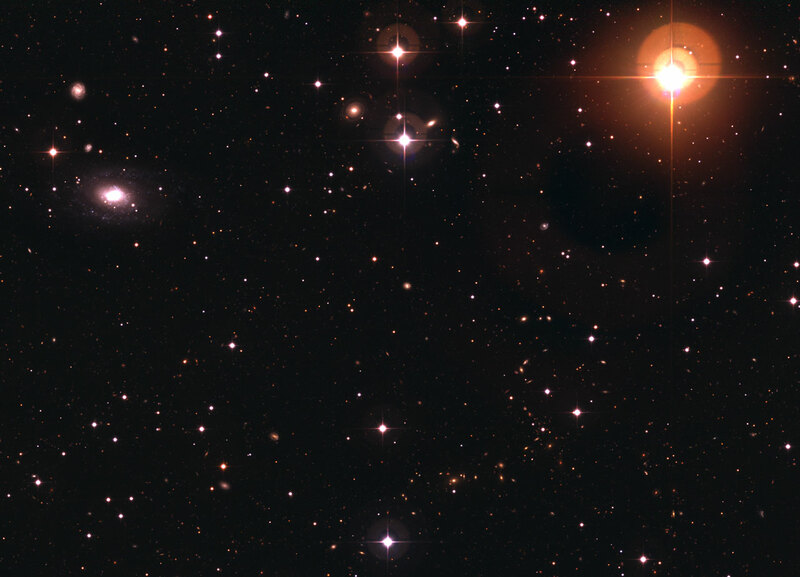 The second and third brightest stars in this image are visible in the lower far right and in the lower middle left. The first is a star slightly more massive than the Sun, HD 98081, while the other is another red giant, HD 98507. In the image, a vast number of stars and galaxies are to be studied and compared. They come in a variety of colours and the stars form amazing asterisms (a group of stars forming a pattern), while the galaxies, which are to be counted by the tens of thousands come in different shapes and some even interact or form part of a cluster. The image and the other associated data will certainly provide a plethora of new results in the years to come. In the meantime, why don't you explore the image with the zoom-in facility, and start your own journey into infinity? Just be careful not to get lost. And remember: don't eat too many of these chocolate eggs! High resolution images and their captions are available on this page. The ESO Deep-Public-Survey (DPS) is a multi-colour imaging survey carried out by the ESO Imaging Survey (EIS) team and consists of data taken in UBVRI-bands taken with the Wide Field Imager (WFI) at the 2.2m telescope at La Silla and infrared data in the J- and Ks-bands observed with SOFI at the New Technology Telescope, also at La Silla. The main scientific drivers for the ESO DPS are searches for high-redshift galaxies, distant clusters, high-redshift quasars, low surface-brightness galaxies, and gravitational lensing studies. The survey was designed in a way to deliver a unique dataset also for studies on Galactic structure, very low-metallicity stars, white dwarfs, M-dwarfs, and field brown dwarfs. The image is based on data processed by the GaBoDS team, a German collaboration led by the Argelander Institut für Astronomie (AIfA), using a specific reduction pipeline, THELI. The team released 63 reduced, photometrically and astrometrically fully calibrated, and stacked images of the optical part. The data are presented in the paper 'GaBoDS: The Garching-Bonn Deep Survey V. Data release of the ESO Deep-Public-Survey' by Hendrik Hildebrandt et al. to be published in Astronomy and Astrophysics and available at astro-ph/0509882. 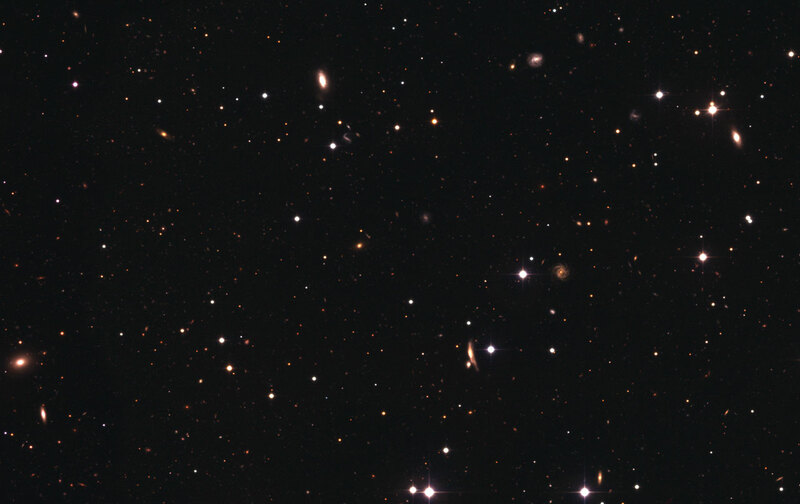 Some of these data, covering the Deep 3 field in the B, V, R, and I-bands, were combined in a colour image by Hännes Heyer and Olivia Blanchemain (ESO).